I'm getting my wrecking tools ready to...well...wreck at tomorrow's Association of Competitive Airsoft Expo at the Insight Interactive Airsoft CQB Facility, located in Rancho Cucamonga, CA (Southern California Airsoft CQB Facility). 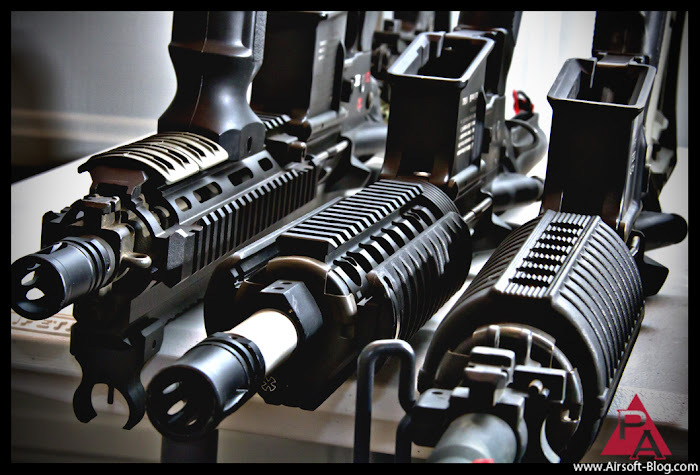 Pictured from left to right, you see there my ELITE FORCE HK416 CQB Custom AEG (VFC OEM), ELITE FORCE M4CR Custom AEG (VFC OEM), and a Classic Army M15A4 Carbine 2009 Edition (Custom tuned, of course). Here are a few shots of the Insight Interactive Airsoft CQB facility. The layout of the field is subject to change for the ACA Expo, however. Insight Interactive Airsoft CQB Facility, Rancho Cucamonga, CA. 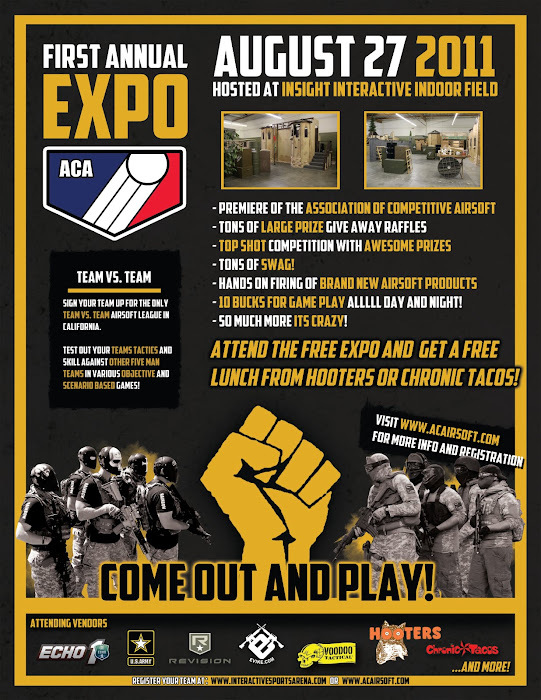 So in case you haven't heard, the first annual ACA Expo is going down tomorrow, August 27, 2011, at the Insight Interactive Airsoft CQB facility. I will be there all day, not only competing in the event with Team 5.11 Tactical, but will also be updating the Pyramyd Airsoft Blog and the Pyramyd Air Facebook page with photos and possibly videos of the day's NUMEROUS activities. See the flyer below for an idea of everything going on. I say "idea" because things like the XBOX 360 Tournament, which is FREE to enter, is not listed. Also, not listed, is that if you'd still like to compete in the ACA Tournament, as of today, they are allowing teams to walk-on the day of the event and register to compete. So good news for your last-minute stragglers, laggers and/or procrastination extraordinaires. ADDITIONALLY, 5.11 Tactical Series has donated over $250 of tactical gear to raffle off to attendees as well. Here is the schedule of events, including times, for tomorrow's ACA Expo at Insight Interactive. Not that it isn't obvious by looking at the image above, but our friends at Elite Force Airsoft have jumped on board as the title sponsor for the event. The fact that I will be using a couple Elite Force guns has nothing to do with them being a sponsor. As God is my witness, I'm taking the Elite Force guns pictured above because I have battle-tested them under harsh conditions and they've performed with extreme reliability, which is what I require of my equipment whenever I'm operating in a competitive environment. The fact that they're a sponsor is purely a coincidence. See my review of the VFC HK416 CQB (Elite Force edition) for more intel on that particular gem from the Elite Force catalog. 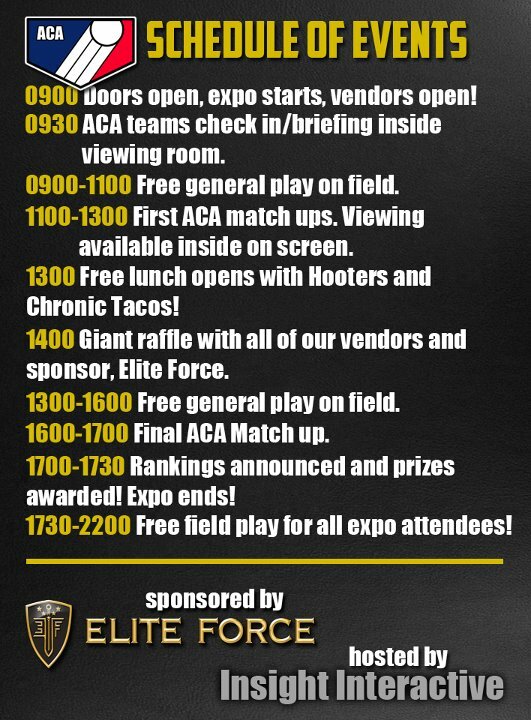 You'll also note on the ACA Expo schedule of events that there will be intervals throughout the day where the public can play Airsoft for FREE!!! So bring your guns, bring your gear, but most importantly, BRING YOUR A-GAME. Below, you can see the layout for the ACA Expo and get an idea of how sweet this thing is going to be. Image courtesy of the ACA. 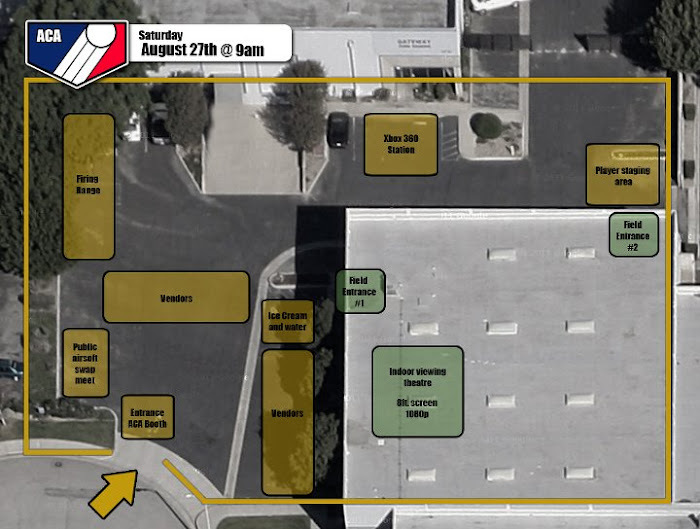 So if you're in the Southern California area (or not) and like Airsoft, Insight Interactive will be the place to be tomorrow, starting at 9 A.M.
Be there! or check in to the Pyramyd Air Facebook page to get updates on how the day is going if you're unable to attend. Or do neither and miss out entirely like a poopy pants.